Since 7 September 2009. Although driving is on the left side of the roadway centre line, Samoa allows cars with steering wheels on either the left or the right side of the vehicle to use the roads. Samoa (/səˈmoʊə/), officially the Independent State of Samoa (Samoan: Malo Saʻoloto Tutoʻatasi o Sāmoa; Samoan: Sāmoa, IPA: [ˈsaːmoa]) and, until 4 July 1997, known as Western Samoa, is a country consisting of two main islands, Savai'i and Upolu, and four smaller islands. The capital city is Apia. The Lapita people discovered and settled the Samoan Islands around 3,500 years ago. They developed a unique Samoan language and Samoan cultural identity. 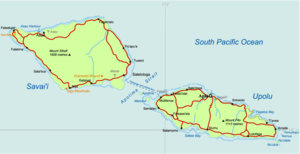 Samoa is a unitary parliamentary democracy with eleven administrative divisions. The country is a member of the Commonwealth of Nations. Western Samoa was admitted to the United Nations on 15 December 1976. The entire island group, which includes American Samoa, was called "Navigator Islands" by European explorers before the 20th century because of the Samoans' seafaring skills. New Zealand scientists have dated remains in Samoa to about 2900 years ago. These were found at a Lapita site at Mulifanua and the findings were published in 1974. The origins of the Samoans are closely studied in modern research about Polynesia in various scientific disciplines such as genetics, linguistics and anthropology. Scientific research is ongoing, although a number of different theories exist; including one proposing that the Samoans originated from Austronesian predecessors during the terminal eastward Lapita expansion period from Southeast Asia and Melanesia between 2,500 and 1,500 BCE. Visits by American trading and whaling vessels were important in the early economic development of Samoa. The Salem brig Roscoe (Captain Benjamin Vanderford), in October 1821, was the first American trading vessel known to have called, and the Maro (Captain Richard Macy) of Nantucket, in 1824, was the first recorded United States whaler at Samoa. The whalers came for fresh drinking water, firewood and provisions, and later, they recruited local men to serve as crewmen on their ships. Christian missionary work in Samoa began in 1830 when John Williams of the London Missionary Society arrived in Sapapali'i from the Cook Islands and Tahiti. According to Barbara A. West, "The Samoans were also known to engage in ‘headhunting', a ritual of war in which a warrior took the head of his slain opponent to give to his leader, thus proving his bravery." However, Robert Louis Stevenson, who lived in Samoa from 1889 until his death in 1894, wrote in A Footnote to History: Eight Years of Trouble in Samoa, "… the Samoans are gentle people." Britain also sent troops to protect British business enterprise, harbour rights, and consulate office. This was followed by an eight-year civil war, during which each of the three powers supplied arms, training and in some cases combat troops to the warring Samoan parties. The Samoan crisis came to a critical juncture in March 1889 when all three colonial contenders sent warships into Apia harbour, and a larger-scale war seemed imminent. A massive storm on 15 March 1889 damaged or destroyed the warships, ending the military conflict. The Second Samoan Civil War reached a head in 1898 when Germany, the United Kingdom, and the United States were locked in dispute over who should control the Samoa Islands. The Siege of Apia occurred in March 1899. Samoan forces loyal to Prince Tanu were besieged by a larger force of Samoan rebels loyal to Mata'afa Iosefo. Supporting Prince Tanu were landing parties from four British and American warships. After several days of fighting, the Samoan rebels were finally defeated. American and British warships shelled Apia on 15 March 1899, including the USS Philadelphia. Germany, the United Kingdom and the United States quickly resolved to end the hostilities and divided the island chain at the Tripartite Convention of 1899, signed at Washington on 2 December 1899 with ratifications exchanged on 16 February 1900. The eastern island-group became a territory of the United States (the Tutuila Islands in 1900 and officially Manu'a in 1904) and was known as American Samoa. The western islands, by far the greater landmass, became German Samoa. 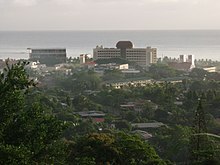 The United Kingdom had vacated all claims in Samoa and in return received (1) termination of German rights in Tonga, (2) all of the Solomon Islands south of Bougainville, and (3) territorial alignments in West Africa. 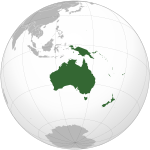 The German Empire governed the western Samoan islands from 1900 to 1914. Wilhelm Solf was appointed the colony's first governor. In 1908, when the non-violent Mau a Pule resistance movement arose, Solf did not hesitate to banish the Mau leader Lauaki Namulau'ulu Mamoe to Saipan in the German Northern Mariana Islands. The German colonial administration governed on the principle that "there was only one government in the islands." Thus, there was no Samoan Tupu (king), nor an alii sili (similar to a governor), but two Fautua (advisors) were appointed by the colonial government. Tumua and Pule (traditional governments of Upolu and Savai'i) were for a time silent; all decisions on matters affecting lands and titles were under the control of the colonial Governor. In the first month of World War I, on 29 August 1914, troops of the New Zealand Expeditionary Force landed unopposed on Upolu and seized control from the German authorities, following a request by Great Britain for New Zealand to perform this "great and urgent imperial service." From the end of World War I until 1962, New Zealand controlled Samoa as a Class C Mandate under trusteeship through the League of Nations, then through the United Nations. There followed a series of New Zealand administrators who were responsible for two major incidents. In the first incident, approximately one fifth of the Samoan population died in the influenza epidemic of 1918–1919. Between 1919 and 1962, Samoa was administered by the Department of External Affairs, a government department which had been specially created to oversee New Zealand's Island Territories and Samoa. In 1943, this Department was renamed the Department of Island Territories after a separate Department of External Affairs was created to conduct New Zealand's foreign affairs. By 1918, Samoa had a population of some 38,000 Samoans and 1,500 Europeans. However, Samoans greatly resented New Zealand's colonial rule, and blamed inflation and the catastrophic 1918 flu epidemic on its misrule. By the late 1920s the resistance movement against colonial rule had gathered widespread support. One of the Mau leaders was Olaf Frederick Nelson, a half Samoan and half Swedish merchant. Nelson was eventually exiled during the late 1920s and early 1930s, but he continued to assist the organisation financially and politically. In accordance with the Mau's non-violent philosophy, the newly elected leader, High Chief Tupua Tamasese Lealofi, led his fellow uniformed Mau in a peaceful demonstration in downtown Apia on 28 December 1929. The New Zealand police attempted to arrest one of the leaders in the demonstration. When he resisted, a struggle developed between the police and the Mau. The officers began to fire randomly into the crowd and a Lewis machine gun, mounted in preparation for this demonstration, was used to disperse the demonstrators. Chief Tamasese was shot from behind and killed while trying to bring calm and order to the Mau demonstrators, screaming "Peace, Samoa". Ten others died that day and approximately 50 were injured by gunshot wounds and police batons. That day would come to be known in Samoa as Black Saturday. The Mau grew, remaining steadfastly non-violent, and expanded to include the highly influential women's branch. After repeated efforts by the Samoan independence movement, the New Zealand Western Samoa Act 1961 of 24 November 1961 granted Samoa independence, effective on 1 January 1962, upon which the Trusteeship Agreement terminated. Samoa also signed a friendship treaty with New Zealand. Samoa, the first small-island country in the Pacific to become independent, joined the Commonwealth of Nations on 28 August 1970. While independence was achieved at the beginning of January, Samoa annually celebrates 1 June as its independence day. 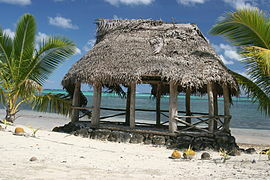 Travel writer Paul Theroux noted marked differences between the societies in Western Samoa and American Samoa in 1992. In 2002, New Zealand's prime minister Helen Clark formally apologised for New Zealand's role in the events of 1918 and 1929. On 4 July 1997 the government amended the constitution to change the country's name from Western Samoa to Samoa. American Samoa protested against the move, asserting that the change diminished its own identity. On 7 September 2009, the government changed the driving orientation for motorists: Samoans now drive on the left side of the road like in most other Commonwealth countries. This brought Samoa into line with many other countries in the region. Samoa thus became the first country in the 21st century to switch to driving on the left. At the end of December 2011, Samoa jumped forward by one day, omitting 30 December from the local calendar, when the nation moved to the west of the International Date Line. This change aimed to help the nation boost its economy in doing business with Australia and New Zealand. Before this change, Samoa was 21 hours behind Sydney, but the change means it is now three hours ahead. The previous time zone, implemented on 4 July 1892, operated in line with American traders based in California. In June 2017, Parliament established an amendment to Article 1 of the Samoan Constitution, thereby making Christianity the state religion. The 1960 constitution, which formally came into force with independence from New Zealand in 1962, builds on the British pattern of parliamentary democracy, modified to take account of Samoan customs. The national modern Government of Samoa is referred to as the Malo. Fiame Mata'afa Faumuina Mulinu’u II, one of the four highest-ranking paramount chiefs in the country, became Samoa's first Prime Minister. Two other paramount chiefs at the time of independence were appointed joint heads of state for life. 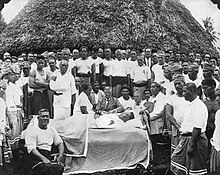 Tupua Tamasese Mea'ole died in 1963, leaving Malietoa Tanumafili II sole head of state until his death on 11 May 2007, upon which Samoa changed from a constitutional monarchy to a parliamentary republic de facto. [dubious – discuss] The next Head of State, Tuiatua Tupua Tamasese Efi, was elected by the legislature on 17 June 2007 for a fixed five-year term, and was re-elected unopposed in July 2012. Tufuga Efi was succeeded by Va'aletoa Sualauvi II in 2017. The unicameral legislature (the Fono) consists of 49 members serving 5-year terms. Forty-seven are matai title-holders elected from territorial districts by Samoans; the other two are chosen by non-Samoans with no chiefly affiliation on separate electoral rolls. Universal suffrage was adopted in 1990, but only chiefs (matai) may stand for election to the Samoan seats. There are more than 25,000 matais in the country, about 5% of whom are women. The prime minister, chosen by a majority in the Fono, is appointed by the head of state to form a government. The prime minister's choices for the 12 cabinet positions are appointed by the head of state, subject to the continuing confidence of the Fono. Prominent women in Samoan politics include the late Laulu Fetauimalemau Mata'afa (1928–2007) from Lotofaga constituency, the wife of Samoa's first prime minister. Their daughter Fiame Naomi Mata'afa is a paramount chief and a long-serving senior member of cabinet. Other women in politics include Samoan scholar and eminent professor Aiono Fanaafi Le Tagaloa, orator-chief Matatumua Maimoana and Safuneitu'uga Pa'aga Neri (as of 2016[update] the Minister of Communication and Technology). Samoa comprises eleven itūmālō (political districts). These are the traditional eleven districts which predate European arrival. Each district has its own constitutional foundation (faavae) based on the traditional order of title precedence found in each district's faalupega (traditional salutations). Major areas of concern include the under-representation of women, domestic violence and poor prison conditions. Homosexual acts are illegal in Samoa. In June 2017, an Act was passed changing the country's constitution to include a reference to the Trinity. As amended, Article 1 of the Samoan Constitution states that “Samoa is a Christian nation founded of God the Father, the Son and the Holy Spirit”. According to The Diplomat, "What Samoa has done is shift references to Christianity into the body of the constitution, giving the text far more potential to be used in legal processes." The preamble to the constitution already described the country as "an independent State based on Christian principles and Samoan custom and traditions." Samoa lies south of the equator, about halfway between Hawaii and New Zealand, in the Polynesian region of the Pacific Ocean. The total land area is 2,842 km2 (1,097 sq mi), consisting of the two large islands of Upolu and Savai'i (which together account for 99% of the total land area) and eight small islets. These are the three islets in the Apolima Strait (Manono Island, Apolima and Nu'ulopa), the four Aleipata Islands off the eastern end of Upolu (Nu'utele, Nu'ulua, Namua, and Fanuatapu), and Nu'usafe'e which is less than 1 hectare (2½ acres) in area and about 1.4 km (0.9 mi) off the south coast of Upolu at the village of Vaovai. 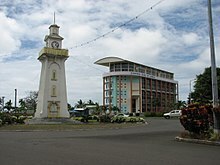 The main island of Upolu is home to nearly three-quarters of Samoa's population, and to the capital city, Apia. 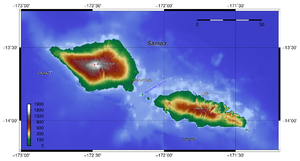 The Samoan islands result geologically from volcanism, originating with the Samoa hotspot which probably results from a mantle plume. While all of the islands have volcanic origins, only Savai'i, the westernmost island in Samoa, remains volcanically active, with the most recent eruptions in Mt Matavanu (1905–1911), Mata o le Afi (1902) and Mauga Afi (1725). The highest point in Samoa is Mt Silisili, at 1858 m (6,096 ft). The Saleaula lava fields situated on the central north coast of Savai'i are the result of the Mt Matavanu eruptions which left 50 km2 (20 sq mi) of solidified lava. The climate is equatorial/monsoonal, with an average annual temperature of 26.5 °C (79.7 °F) and a rainy season from November to April. Savai'i is the largest of the Samoan islands and the sixth largest Polynesian island (after New Zealand's North, South and Stewart Islands and the Hawaiian islands of Hawaiʻi and Maui). The population of Savai'i is 42,000 people. Samoa forms part of the Samoan tropical moist forests ecoregion. Since human habitation began, about 80% of the lowland rainforests have been lost. Within the ecoregion about 28% of plants and 84% of land birds are endemic. The United Nations has classified Samoa as an economically developing country since 2014. In 2017, Samoa's gross domestic product in purchasing power parity was estimated to be $1.13 billion U.S. dollars, ranking 204th among all countries. The services sector accounted for 66% of GDP, followed by industry and agriculture at 23.6% and 10.4%, respectively. The same year, the Samoan labour force was estimated at 50,700. The country's currency is the Samoan tālā, issued and regulated by the Central Bank of Samoa. The economy of Samoa has traditionally been dependent on agriculture and fishing at the local level. In modern times, development aid, private family remittances from overseas, and agricultural exports have become key factors in the nation's economy. Agriculture employs two-thirds of the labour force and furnishes 90% of exports, featuring coconut cream, coconut oil, noni (juice of the nonu fruit, as it is known in Samoan), and copra. Outside of a large automotive wire harness factory (Yazaki Corporation which ended production in August 2017), the manufacturing sector mainly processes agricultural products. Tourism is an expanding sector which now accounts for 25% of GDP. Tourist arrivals have been increasing over the years with more than 100,000 tourists visiting the islands in 2005, up from 70,000 in 1996. The Samoan government has called for deregulation of the financial sector, encouragement of investment, and continued fiscal discipline. Observers point to the flexibility of the labour market as a basic strength for future economic advances. The sector has been helped enormously by major capital investment in hotel infrastructure, political instability in neighbouring Pacific countries, and the 2005 launch of Virgin Samoa a joint-venture between the government and Virgin Australia (then Virgin Blue). In the period before German colonisation, Samoa produced mostly copra. German merchants and settlers were active in introducing large scale plantation operations and developing new industries, notably, cocoa bean and rubber, relying on imported labourers from China and Melanesia. When the value of natural rubber fell drastically, about the end of the Great War (World War I), the New Zealand government encouraged the production of bananas, for which there is a large market in New Zealand. Because of variations in altitude, a large range of tropical and subtropical crops can be cultivated, but land is not generally available to outside interests. Of the total land area of 2,934 km2 (725,000 acres), about 24.4% is in permanent crops and another 21.2% is arable. About 4.4% is Western Samoan Trust Estates Corporation (WSTEC). The staple products of Samoa are copra (dried coconut meat), cocoa bean (for chocolate), and bananas. 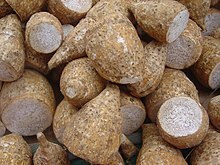 The annual production of both bananas and copra has been in the range of 13,000 to 15,000 metric tons (about 14,500 to 16,500 short tons). If the rhinoceros beetle in Samoa were eradicated, Samoa could produce in excess of 40,000 metric tons (44,000 short tons) of copra. Samoan cocoa beans are of very high quality and used in fine New Zealand chocolates. Most are Criollo-Forastero hybrids. Coffee grows well, but production has been uneven. WSTEC is the biggest coffee producer. Rubber has been produced in Samoa for many years, but its export value has little impact on the economy. Sixty percent of Samoa's electricity comes from renewable hydro, solar, and wind sources, with the remainder from diesel generators. The Electric Power Corporation has a goal of 100% renewable energy by 2021. Samoa reported a population of 194,320 in its 2016 census. About three-quarters of the population live on the main island of Upolu. Samoan (Gagana Fa'asāmoa) and English are the official languages. Including second-language speakers, there are more speakers of Samoan than English in Samoa. Samoan Sign Language is also commonly used among the deaf population of Samoa. To emphasize the importance of full inclusion with sign language, elementary Samoan Sign Language was taught to members of the Samoa Police Service, Red Cross Society, and public during the 2017 International Week of the Deaf. Since 2012, Article 1 of the Samoan Constitution states that “Samoa is a Christian nation founded of God the Father, the Son and the Holy Spirit”. 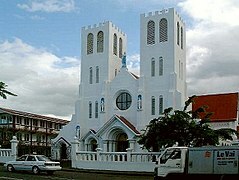 Samoans' religious adherence includes the following: Christian Congregational Church of Samoa 31.8%, Roman Catholic 19.4%, Methodist 15.2%, Assembly of God 13.7%, The Church of Jesus Christ of Latter-day Saints 7.6%, Seventh-day Adventist 3.9%, Worship Centre 1.7%, other Christian 5.5%, other 0.7%, none 0.1%, unspecified 0.1% (2011 estimate). The Head of State until 2007, His Highness Malietoa Tanumafili II, was a Bahá'í. 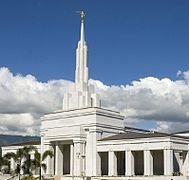 Samoa hosts the seventh (of nine current) Bahá'í Houses of Worship in the world; completed in 1984 and dedicated by the Head of State, it is located in Tiapapata, 8 km (5 mi) from Apia. The Samoan government provides eight years of primary and secondary education that is tuition-free and is compulsory through age 16. Samoa's main post-secondary educational institution is the National University of Samoa, established in 1984. The country is also home to several branches of the multi-national University of the South Pacific and the Oceania University of Medicine. Education in Samoa has proved to be effective as a 2012 UNESCO report stated that 99 per cent of Samoan adults are literate. The Samoan siva dance has unique gentle movements of the body in time to music and tells a story, although the Samoan male dances can be more snappy. The sasa is also a traditional dance where rows of dancers perform rapid synchronised movements in time to the rhythm of wooden drums (pate) or rolled mats. Another dance performed by males is called the fa'ataupati or the slap dance, creating rhythmic sounds by slapping different parts of the body. This is believed to have been derived from slapping insects on the body. As with other Polynesian cultures (Hawaiian, Tahitian and Māori) with significant and unique tattoos, Samoans have two gender specific and culturally significant tattoos. For males, it is called the Pe'a and consists of intricate and geometrical patterns tattooed that cover areas from the knees up towards the ribs. A male who possesses such a tatau is called a soga'imiti. A Samoan girl or teine is given a malu, which covers the area from just below her knees to her upper thighs. Albert Wendt is a significant Samoan writer whose novels and stories tell the Samoan experience. In 1989, his novel Flying Fox in a Freedom Tree was made into a feature film in New Zealand, directed by Martyn Sanderson. Another novel Sons for the Return Home had also been made into a feature film in 1979, directed by Paul Maunder. The late John Kneubuhl, born in American Samoa, was an accomplished playwright and screenwriter and writer. Sia Figiel won the 1997 Commonwealth Writers' Prize for fiction in the south-east Asia/South Pacific region with her novel "Where We Once Belonged". Momoe Malietoa Von Reiche is an internationally recognised poet and artist. Tusiata Avia is a performance poet. Her first book of poetry Wild Dogs Under My Skirt was published by Victoria University Press in 2004. Dan Taulapapa McMullin is an artist and writer. Other Samoan poets and writers include Sapa'u Ruperake Petaia, Eti Sa'aga and Savea Sano Malifa, the editor of the Samoa Observer. Lemi Ponifasio is a director and choreographer who is prominent internationally with his dance Company MAU. Neil Ieremia's company Black Grace has also received international acclaim with tours to Europe and New York. Hip hop has had a significant impact on Samoan culture. According to Katerina Martina Teaiwa, PhD from the University of Hawaii at Manoa, "Hip hop culture in particular is popular amongst Samoan youth." As in many other countries, hip hop music is popular. In addition, the integration of hip hop elements into Samoan tradition also "testifies to the transferability of the dance forms themselves," and to the "circuits through which people and all their embodied knowledge travel." Dance both in its traditional form and its more modern forms has remained a central cultural currency to Samoans, especially youths. The arts organisation Tautai is a collective of visual artists including Fatu Feu'u, Johnny Penisula, Shigeyuki Kihara, Michel Tuffery, and Lily Laita. Rugby union is the national sport in Samoa and the national team, nicknamed the Manu Samoa, is consistently competitive against teams from vastly more populous nations. Samoa has competed at every Rugby World Cup since 1991, and made the quarter finals in 1991, 1995 and the second round of the 1999 World Cup. At the 2003 world cup, Manu Samoa came close to beating eventual world champions, England. Samoa also played in the Pacific Nations Cup and the Pacific Tri-Nations. The sport is governed by the Samoa Rugby Football Union, who are members of the Pacific Islands Rugby Alliance, and thus, also contribute to the international Pacific Islanders rugby union team. Rugby league is mostly played by Samoans living in New Zealand and Australia. Samoa reached the quarter finals of the 2013 Rugby League World Cup, the team comprising players from the NRL and Super League plus domestic players. Many Samoans and New Zealanders or Australians of Samoan descent play in the Super League and National Leagues in Britain, including Francis Meli, Ta'ane Lavulavu of Workington Town, Maurie Fa'asavalu of St Helens and David Fatialofa of Whitehaven and Setima Sa who signed with London Irish rugby club. Other noteworthy players from NZ and Australia have represented the Samoan National team. The 2011 domestic Samoan rugby league competition contained 10 teams with plans to expand to 12 in 2012. American football is occasionally played in Samoa, reflecting its wide popularity in American Samoa, where the sport is played under high school sanction. About 30 ethnic Samoans, many from American Samoa, currently play in the National Football League. A 2002 article from ESPN estimated that a Samoan male (either an American Samoan or a Samoan living in the mainland United States) is 40 times more likely to play in the NFL than a non-Samoan American. ^ Hiery, Hermann (1992). "West Samoans between Germany and New Zealand 1914–1921". War and Society. 10 (1): 53–80. doi:10.1179/072924792791198986. ^ "Celebration of Samoa’s Independence Day", Te Ara Encyclopedia of New Zealand. Retrieved 1 June 2014. ^ "Independence Day", United Nations. Retrieved 1 June 2014. ^ Koppers, Anthony A.P. (June 2008). "Samoa reinstated as a primary hotspot trail". Geology. 36 (6): 435–438. doi:10.1130/G24630A.1. Gill, B.J. (1993). "The land reptiles of Western Samoa". Journal of the Royal Society of New Zealand. 23 (2): 79–89. doi:10.1080/03036758.1993.10721219.